HABIT: Big, bold-textured foliage and long lasting blue or pink flowers through the summer. Completely bare in winter. Native to Japan and China. CULTURE: Although shade loving, will produce more and larger flowers in bright places. Likes moist, richly organic soil best. Prune immediately after blooms fade away. Add acidifiers for blue flowers. USES: Summer leaf texture and flower color. Should be used in association with evergreen plants. PROBLEMS: None serious. Likes a lot of water. 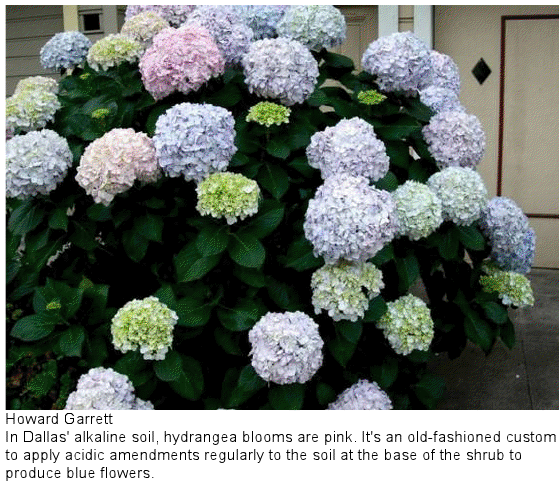 A: Acid fertilizers really aren’t important to turn the pink hydrangea (in alkaline soil) to the blue color acid soils produce. For example, some synthetic fertilizers are acidic and they do a lot of damage to the soil and plants. What you want is any organic fertilizer that will stimulate biological activity in the soil. I use dry molasses at about 20 lbs. per 1,000 square feet. Additional amendments that provide trace minerals can help as well, things such as green sand, soft rock phosphate, decomposed granite and volcanic sands.